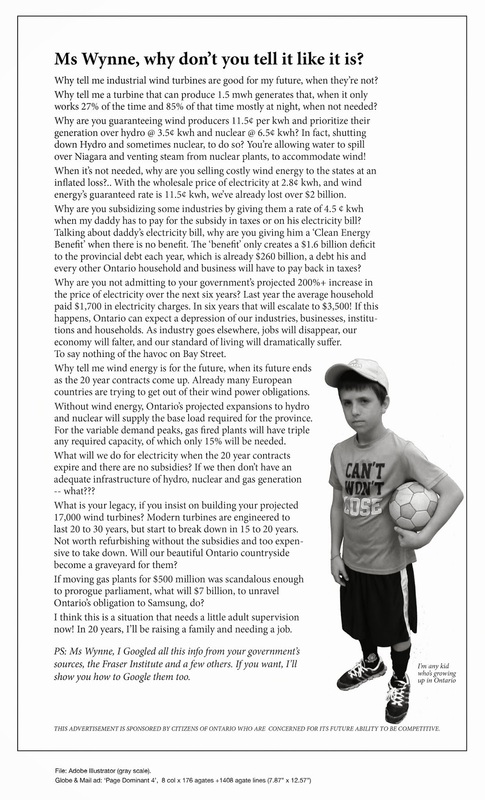 CCSAGE attacks the Green Energy Act head-on | Mothers Against Wind Turbines Inc.
PICTON, ONTARIO. NOVEMBER 30, 2015. At the Ottawa Divisional Court, CCSAGE Naturally Green (CCSAGE NG) has filed notice for a Judicial Review of the process by which on July 16ththe Ontario Ministry of Environment and Climate Change issued a Renewable Energy Approval for the White Pines wind energy project of 27, perhaps 29, turbines in Prince Edward County. As part of this REA approval process, on September 11th, 2015, the Minister of Natural Resources and Forests issued a permit for the project to kill, harm and harass endangered or threatened species at risk. Citing institutional bias, lack of science-based studies, disallowance of municipal input, and denial of natural justice, CCSAGE NG has prepared affidavit evidence exceeding 1500 pages claiming that the Ontario government’s approval process has violated several constitutional rights of rural citizens and communities as well as international treaties and agreements. CCSAGE NG is a federally incorporated not-for-profit corporation.. It works with citizens and other groups to ensure that “Green Energy” initiatives of governments and industry are safe and appropriate for the citizens, the wildlife and the natural and heritage environments of Prince Edward County. CCSAGE NG continues to support other groups appealing two wind energy projects in the County. However, Ontario’s Green Energy Act permits Environmental Review Tribunal (ERT) appeals only on grounds of serious harm to humans or serious and irreversible harm to animal and/or plant life and to the natural environment. That Act does not permit ERT appeals on any other grounds such as biased approval processes, denial of natural justice, violation of constitutional rights, harm to local economies, harm to tourism, harm to heritage assets, diminution of property values, or violation of international treaties and agreements. CCSAGE NG has therefore filed its application for a Judicial Review of this project’s approval process, in an effort to restore equity, accountability and justice. CCSAGE NG Chair Anne Dumbrille observed that, at an ERT, it is difficult for citizens to get a fair hearing of their grievances against government-approved wind projects because the ERT process is heavily biased in favour of the wind energy developer and the government ministries that approve its projects. “ERTs are government-appointed tribunals that follow government rules and use taxpayer-funded lawyers to permit destruction of environmentally sensitive areas and to deny natural justice to local citizens who have constitutionally assured rights and freedoms. Our only recourse is to Canada’s courts, where rules of equitable justice prevail,” she said. In preparing the Application, CCSAGE NG has had the benefit of considerable research contributed by five students from the Osgoode Hall Law School at York University.